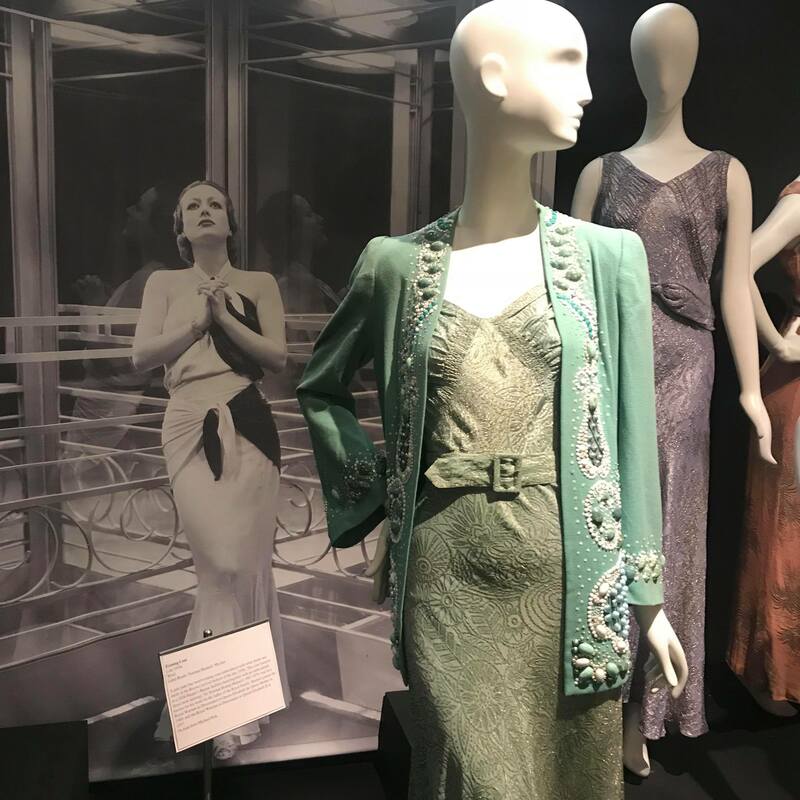 Following the success of the Fashion and Textile Museum’s 2017’s 1920s Jazz Age: Fashion and Photographs exhibition, Night and Day: 1930s Fashion and Photographs picks up from the stock market crash and provides an overview of fashion and society in 1930s. Upon entering the exhibition, archival film footage plays on a screen accompanied by a period soundtrack, which can be heard very softly as you continue throughout the exhibition. 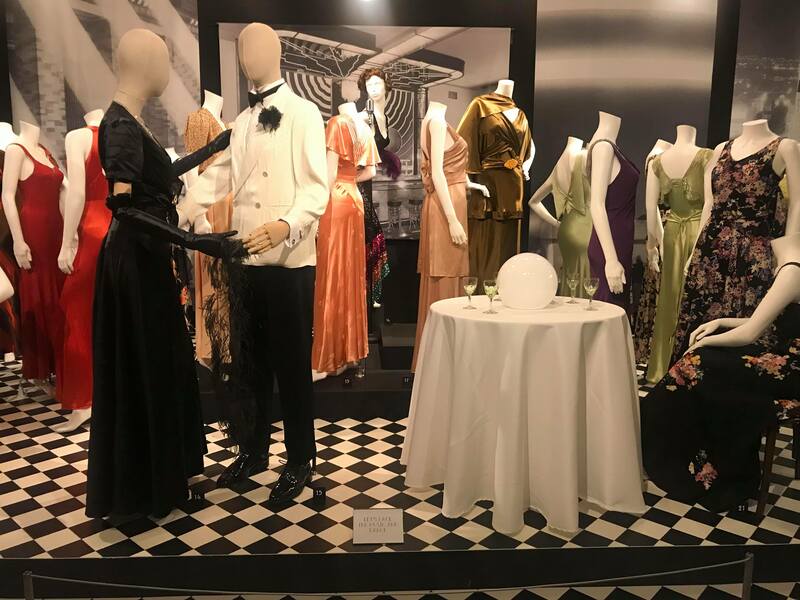 The first part of the exhibition focuses on ‘night’ – a plethora of swoon worthy evening gowns are displayed in sumptuous silks, satins and sequin. Mannequins displayed in large groups allow the viewer to see an expansive range of techniques, fabrics and colours, all popular during the decade (see image 1). Erogenous zones, such as the back and shoulders which were popular design features of the decade, are displayed on mannequins which face backwards or are contorted to allow the viewer a closer inspection of the intricacies of the design details. The close relationship between cinema and consumption is also highlighted here with languid low backed gowns set amongst the glowing lights and head shots of glamorous Hollywood stars (see image 2). Throughout the exhibition, mannequins are numbered with full descriptions, beautifully presented in the accompanying exhibition booklet. This allows the viewer to not only gain further context into the garments on display but also encourages soul attention to the exhibition itself - not an easy feat in this digital age. Mannequins are mounted throughout the exhibition in various grouped scenes such as ‘Life Is Just A Bowl of Cherries’ and ’Happy Days Are Here Again’. Posed mannequins are used throughout with staged group scenes amongst varying props and settings. There is a small amount of menswear and children’s wear on display throughout the exhibition which allows the viewer a greater understanding of the decade’s style and highlights the correlations between children’s wear and womenswear of the time (see image 3). 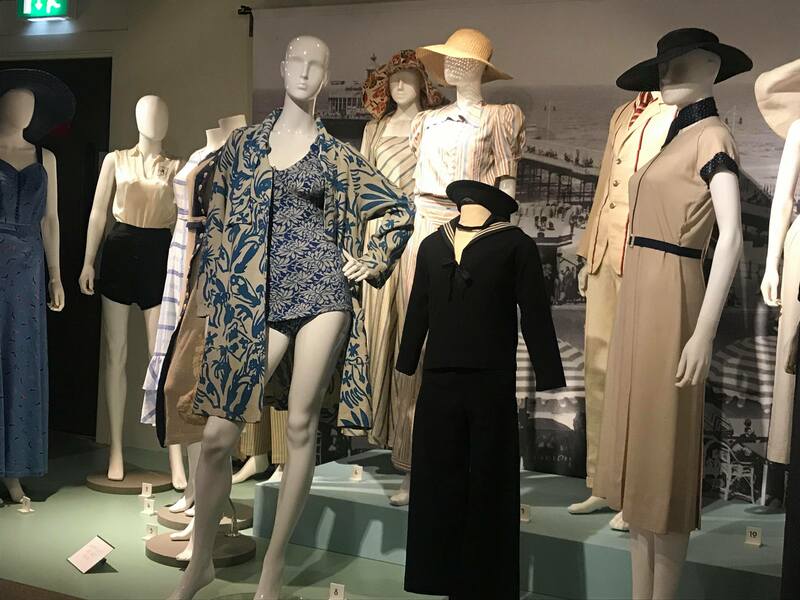 The upper level of the exhibition is dedicated to ‘daywear’ with highlights including gauzy, striped balloon sleeved pyjama suits and Bakelite buttoned rayon frocks. 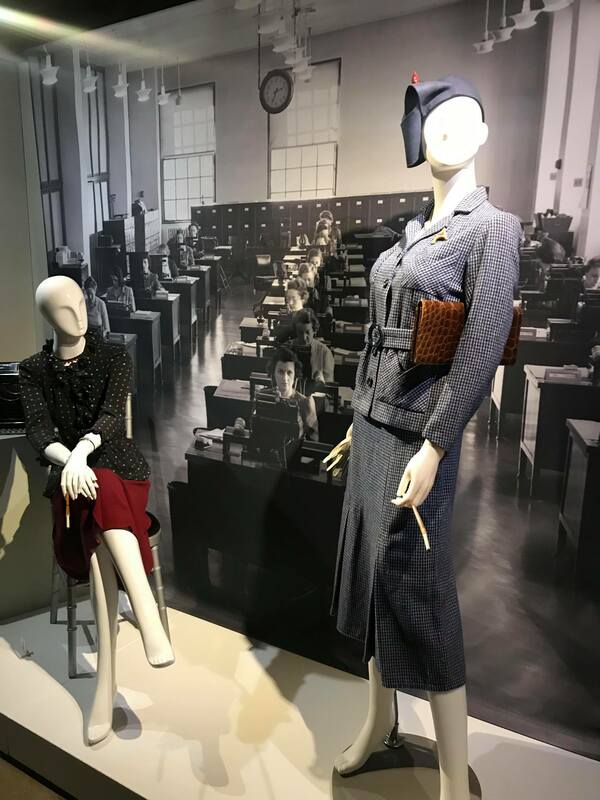 Everyday 1930s fashions are becoming increasingly difficult to find in both vintage stores and museum collections so it was a real treat to see examples of garments such as maid dresses and classic separates that would be worn daily (see image 4). The exhibition culminates with Cecil Beaton: Thirty from the 30s | Fashion, Film and Fantasy, a photography exhibition featuring Beaton’s photographs of some of the eras most influential figures including Elsa Schiaparelli, Wallis Simpson and Salvador Dali.